This multi-faceted GSM-module took the world by storm when it was first introduced to an eager public in 2011, and it continues to impress by putting unsurpassed convenience quite literally at the user’s fingertips. Historically laborious tasks such as arming alarms or switching on pool pumps became, with the advent of the G-SWITCH-22, as easy as initiating a missed call from your mobile phone or land line, while the unit’s dual inputs allow for the monitoring of any number of electrical devices. We daresay the airwaves will never be the same! CENTSYS has always had a reputation for taking the very concepts of security and convenience to the next level and, for exactly that reason, the G-WEB interface was created; using the might of the Internet to make the adding, editing and deleting of users and modules even simpler than before. G-WEB is password-protected and allows for the uploading of detailed transaction logs for improved security. What follows below is a brief tutorial on how to load G-SWITCH modules to your profile as well as how to add users to a module using G-WEB. 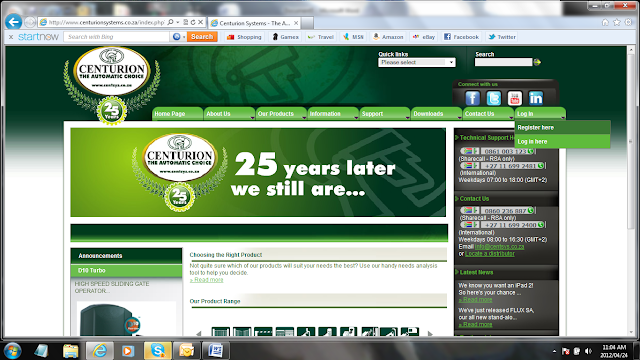 Before you can assign a G-SWITCH module to your profile, you need to register on the CENTSYS Systems website www.centsys.co.za. 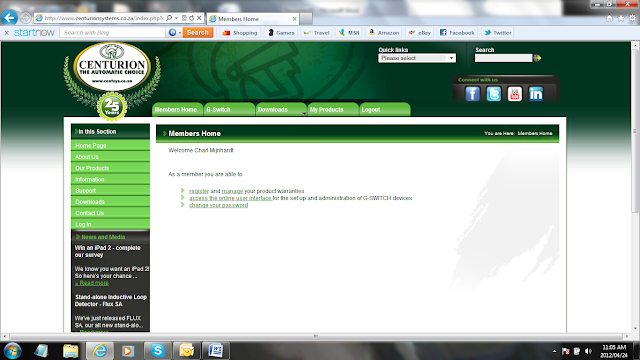 To do this, simply navigate your browser to our Home Page, and click on the Log in tab at the far right of the screen. A dropdown menu will then appear prompting you to either register or log in. Select Register here and fill in all the required fields. Once you have completed this simple registration process, your profile will be registered on our website. After registering, you can immediately log onto the G-WEB interface which will take you to the Members Home screen pictured below. On the Members Home screen, three options will be displayed. Click on the second option, which will be access the online user interface. This action will take you to the G-SWITCH main screen. A grey field will be displayed with the text “No modules associated with this user”. 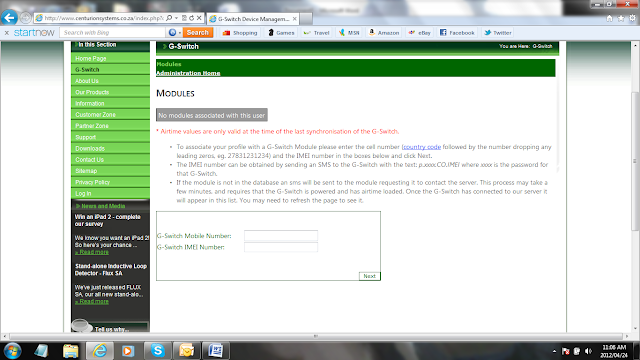 Fill in the required fields for the G-SWITCH mobile number as well as the unique IMEI number of the unit. The mobile number will be the number of the SIM card presently inserted in the G-SWITCH module, while the IMEI number is generally displayed on a sticker found on the onboard GSM module (which will be silver in colour). If you don’t know the IMEI number offhand, simply send the command string p.xxxx.co.imei (where xxxx is the G-SWITCH password) to the module using a standard text message. USEFUL TIP: Remember to enter the G-SWITCH mobile number in the international format! You will now be asked whether the correct mobile operator (for e.g. Cell C or Vodacom) has been detected. If it has, select Yes. If not, click on No and select the applicable country and mobile operator using the dropdown menu provided. A text-box will appear prompting you to either finish assigning the module or to first update changes. If you haven’t made any additional changes, click on the Finish button. The website now needs to synchronise with the module using Over-the-Air protocol. If the connection is successful, the module will appear in a grey block towards the top of the screen. If the website fails to connect, refer to the troubleshooting guide at the end of this tutorial. You can purchase G-WEB SMS bundles from any of our branches! The website uses these SMSs to synchronise with associated G-SWITCH modules, and we give you 10 free SMSs for every module that you assign to your profile. But, should you ever run out, simply drop in to your nearest CENTSYS branch and pick up a bundle voucher. They are cost-effective and we will even load them for you! You can also use the airtime on the G-SWITCH module’s SIM card for synchronisation – just SMS the word “connect” to the module from any mobile phone and voila!, you’re back in business.